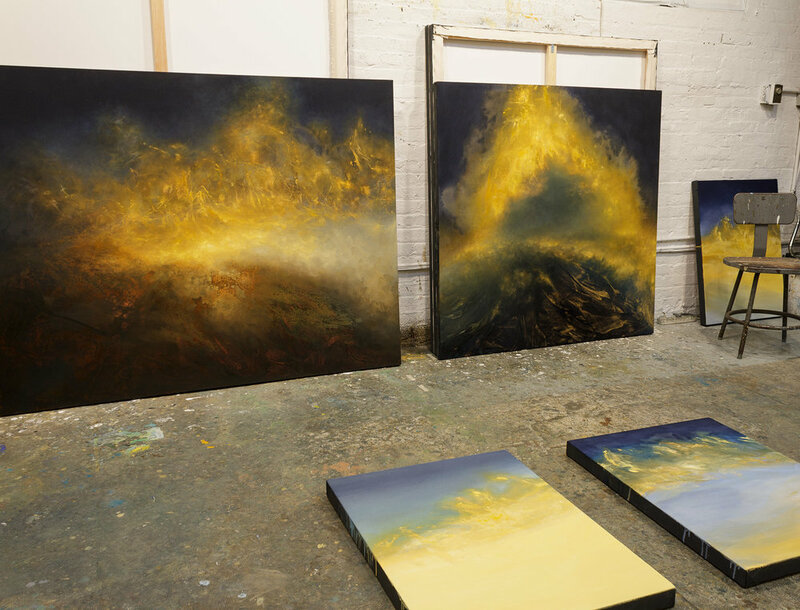 Samantha Keely Smith’s timelessly beautiful paintings now have prophetic significance. She has been painting her fictional landscapes long before environmental crisis became an omnipresent fear and repeated reality, but her paintings’ emotion, imagery and energy increasingly represents our tormented relationship with nature. As expressions of our psychic anxieties, her paintings also appear as portraits of a world before, or after, humanity. I’ve been haunted and captivated by her artwork for years. Following a summer of devastating floods, fires and hurricanes, I sat with Samantha in her New York studio to discuss her prescient vision. Ana Finel Honigman: By balancing strong contrasting colors, your imagery is turbulent but still harmonious. Are you painting a world freed from people? 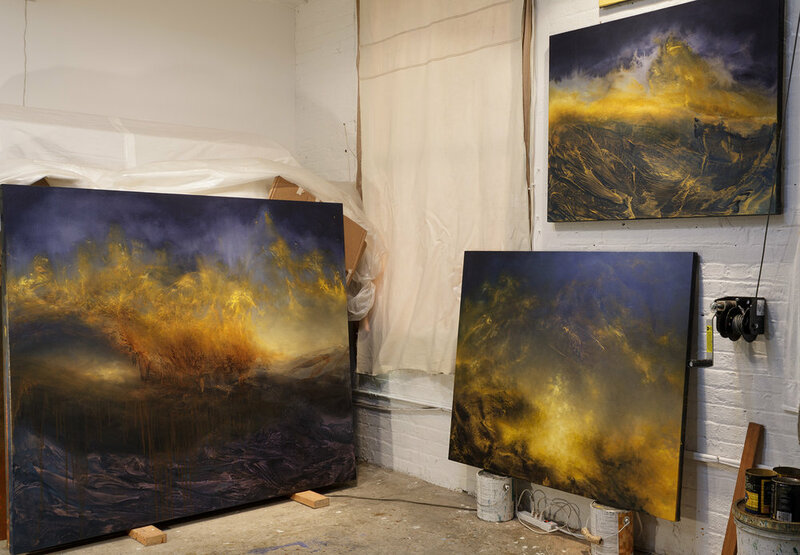 Samantha Keely Smith: I see them as an expression of our internal turbulence, as well. They reflect the overwhelming reality of being constantly aware of what is happening in the wider world. Change is the only constant. AFH: Does repeatedly painting turmoil give you a sense of mastery over it? SKS: These paintings are my way of finding peace within that constant change. AFH: In many ways, your work is extremely prophetic. You’ve been making similarly themed work for two decades and your work’s central issues are increasing in urgency and intensity. SKS: These issues were not as universal when I started the work. AFH: But now, environmental turbulence is affecting people, psychologically and physically, on a mass scale. Regardless of whether someone is directly impacted, an acute awareness of environmental distress impacts everyone. Our sense of the future and personal security is completely upended. SKS: We all feel a similar sense of being out of control in nature. It doesn’t matter how developed a country is, we cannot prevent huge disasters and devastation. The way some people live their lives denies that fact but it is still a reality. We think we can beat nature, or control it, but we never can. AFH: The enormity of physical splendor in America really has shaped our cultural identity. SKS: If you are growing up in that environment, you probably intuitively and always understand that you’re in a fragile place compared to the world around you. You don’t have any delusions of controlling it. AFH: Do men respond differently to your paintings? SKS: I’ve never thought about the male/female gaze. I have people who find them powerful and moving but other people find them peaceful. I find that contrast interesting. I don’t know whether it’s like the feeling of being safe and warm during a thunderstorm, but seeing something like them and knowing you’re not in it might be calming. AFH: I think people with a propensity for anxiety prefer being in the midst of chaos. Having your external reality match your internal reality is very reassuring. Ultimately, I think we all just want two things in life – control and feeling heard. Being anxious, by nature, and being in chaos is vindicating, so the feeling is familiar and you can have a sense of competence. And, when something outside you reflects your essence, then you can feel understood. SKS: Maybe that’s why I like being in a city. I don’t always engage with what the city offers but knowing its outside my window is very satisfying. Knowing that energy is available is something I feed off. AFH: Me too. I sleep best with lots of street sounds! I mean, real street sounds. I sleep so well! SKS: The energy of all the creative minds in New York is something you can even feel. AFH: Did you grow up in nature? SKS: No. I grew up in New Jersey, about an hour from Manhattan. I’ve never lived in a rural place but I had a lot of reoccurring dreams when I grew up about living on farms. AFH: My subconsciousness was shaped by Laura Ingalls Wilder. Were these dreams part of your inspiration? SKS: The truth is that I have these dreams about a place. It only happens every few months but they are extremely intense dreams. There are never any people. It is just a massive natural force, unlike anything I’ve seen in real life or pictures. It feels like a sentient being. It is always moving. The dreams are frightening but also awe-inspiring. They are amazing. I mainly take the colors, light and movement from those dreams. AFH: Are you painting that place? SKS: No, it’s not that I have a dream and then paint the dream. I can’t grasp onto how the images look. I get some but not much. I paint how these dreams make me feel. I try to paint the tension between that feeling and my experience interacting within my reality. AFH: We are so outraged and irritated when nature inconveniences us. SKS: We are shocked when it is raining and we need to take an umbrella. AFH: We refuse to accept that rats and pigeons aren’t interlopers in our cities. The cities are theirs too. Nature exists around us, without our consent. Do you sense a pattern in your life that stimulates the dreams? SKS: You mean, is there an emotional upheaval before the dreams? I can’t say that I do. It is always a surprise. It is like watching a movie. It is very intense. I don’t feel like I am rested after these dreams. It’s once every few months. It’s really like a little seed. AFH: It is an incredible resource to have within you! SKS: Thank you, but it can feel awkward to talk about dreams. It sounds so New Agey. AFH: Not at all! I think Freud is right about dreams being our rawest selves. And your dream imagery is so evocative that it becomes personal for your viewers too. I think people feel alienated and excluded by others’ dreams. It is hard to enter into someone’s unconscious and appreciate the significance of their imagery but yours provokes powerful feelings for people outside you. Do you feel a sense of mastery when painting these? SKS: Are you asking whether it gives me a sense of control over my environment? I do feel the paintings are therapeutic. They help me find a real center of peace. Getting it out there helps me because I hope they’ll connect with other people. I hope something within them will speak to someone else and make a connection. AFH: Your new work is much darker than what I think of when I think of your work. I associate your work with teal but these paintings are largely midnight blue. What inspired the transition? SKS: Most of my work has a light coming from within but these are more nighttime works. There is still that light. The light still comes from the landscape. It is a new technique for me. It’s just evolved naturally. I love the flat, almost velvety look to the stained canvas. With the slight sheen of oil, it creates something completely different. A lot of the movement in the paintings is done with really big brushes or palette knives. I use solvents and move it around, almost as liquid. AFH: These paintings are about the poetic contrast of your feeling credibly vulnerable and overwhelmed by nature outside yourself, yet that experience with nature and environment are within your own psyche. You’ve created an experience to teach yourself to appreciate nature’s massive power. That’s an amazing and very meaningful irony. SKS: These paintings are about the essence of who we all are, as human beings. If all our conveniences were taken away, we would all want to survive and we would all want the same things, including emotional needs. We all want love and connection. We seem to be further and further away from that, especially in cities. It feels like the world, our environment, isn’t real and we don’t take it seriously. But we need to!